Disasteroids is a game that will enable you to “destroy” different kinds of websites. Even though it might seem as a great fun, you should not keep this application on the system because it might cause you inconvenience. The specialists of pcthreat.com have found out that this program falls into the category of advertising-supported applications, which means that you should not expect that it will act somehow usefully. Actually, you will soon find out that this program is just going to flood your browsers with different kinds of advertisements. Users are informed that this application is “supported by high-quality advertising” during the installation; however, not all of them notice the provided information. Do not expect that ads by Disasteroids will stop appearing on your screen one day because one of the main aims of this software is to advertise particular products and services. Luckily, there is still a solution – you just have to delete Disasteroids and all the ads will disappear as well. All these banners, in-text, interstitial, and pop-ups that Disasteroids is going to generate might seem completely harmless; however, the truth is that you should still avoid them because they might expose you to potential threats. Every time you click on the advertisement, you will be routed to some kind of website; unfortunately, nobody can tell whether the website is reliable or not, which means that the possibility to infect the system with malware is present. Keep in mind that it is rather difficult to get rid of malicious software, which is why we believe that you should reduce the possibility to infect the system as soon as possible. 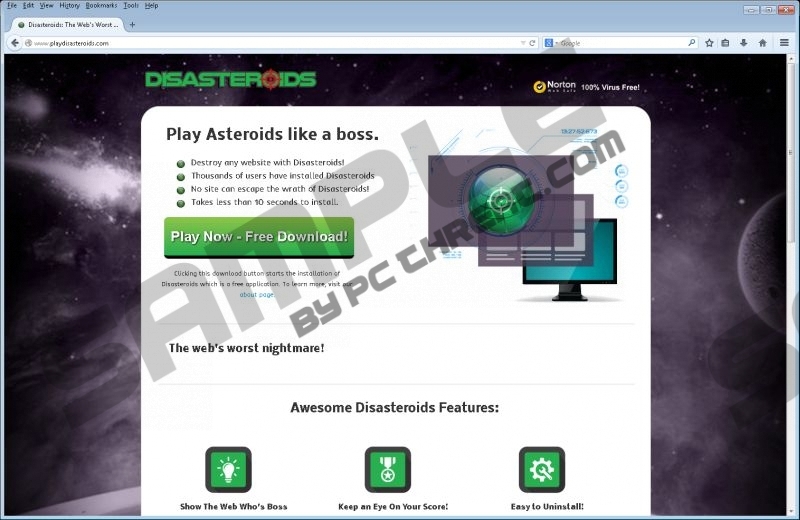 As other similar applications like Websteroids and Radsteroids, this advertising-supported application usually gets onto computer without user’s permission even though it can be downloaded from its official website playdisasteroids.com. Thus, if you have also detected Disasteroids on your computer and cannot remember downloading this application yourself, it is very likely that it has managed to enter your system with a help of other applications. Do not keep it there for any longer if you care about your computer’s security. Disasteroids should be deleted from the system as soon as possible, especially if you do not find it useful or if it bothers you with different kinds of advertisements. The easiest way to get rid of this software is, of course, to scan the system with a licensed antimalware tool; however, if you have ever tried to remove malware manually, you will definitely not find the removal of Disasteroids difficult. When its icon appears, select it. Locate the suspicious software on the list. Find the undesirable application and select it. Quick & tested solution for Disasteroids removal.